This penultimate "Limited Editions Extras" post presents a couple of unrelated screencap series, simply because neither has that many frames. 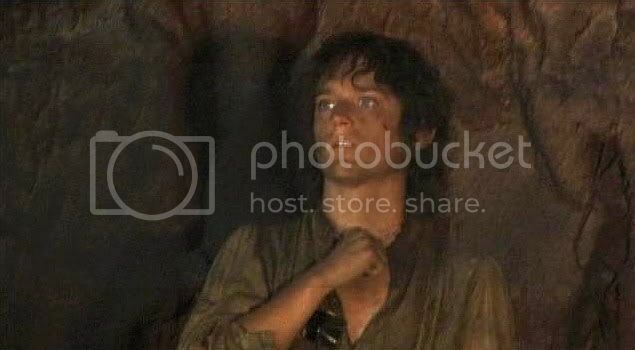 First there are some shots of Elijah Wood performing Frodo struggling with Gollum in the Emyn Muil. Second, there are shots of Elijah watching as Sam's coverage is being filmed for their Sammath Naur scene. As I said in the previous entry, the Extras for The Two Towers are quite good. 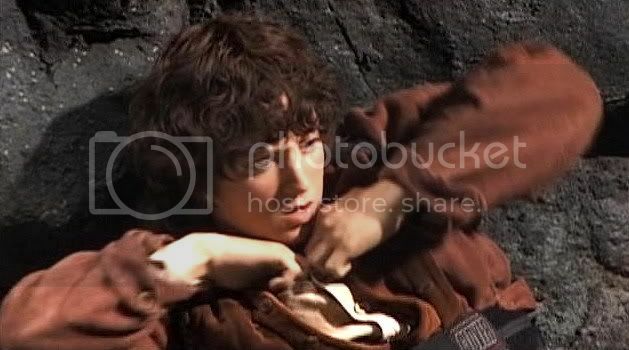 Frodo is in them frequently, but there not much that is good for screencaps. Most of his footage is too distant or blurry to make really worth-while captures. Frodo's segments are better to watch (and hear) as film. One sequence did catch my eye, however. 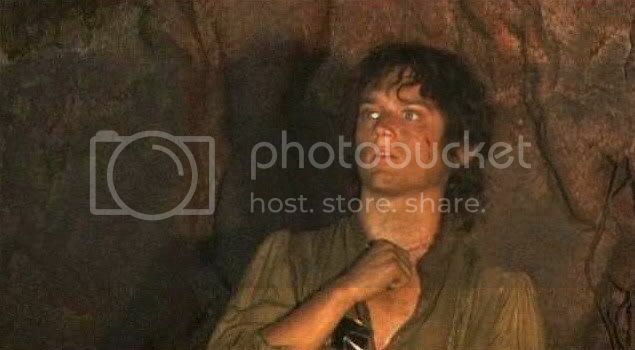 It was well-lit and focussed enough to be able to see Frodo clearly. I pause-stepped through it and chose the images shown below. The first two show Frodo doing his "this is Sting" line, seen from the side, and without digital grading. The focus is quite good since Elijah had to hold the moment while camera and effects people figured out what they needed in order to add digital-Gollum later. 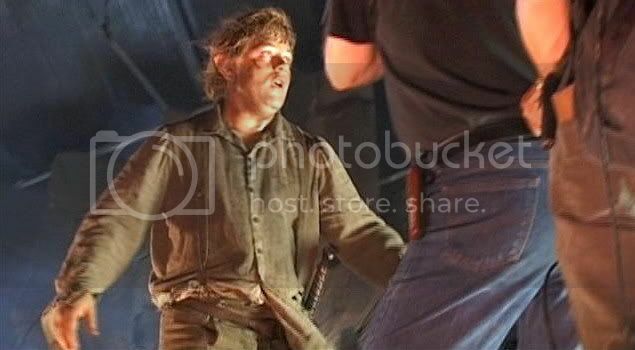 The ones that follow are face shots, fairly focussed, in which Frodo reacts to Gollum during the fight, having thrown Frodo against the rock wall. Gollum is not, in fact, there. Elijah has to recreate the scuffle from memory, so that close-ups can be made. What fascinated me about them was how extremely young Elijah looked in these. I know we are always saying this, but in the last frame, in particular, he could be Huck Finn stuffed into Frodo's velvets and tweeds, with a mop of dark curls plopped on his head. He looks like a boy, not even a teenager, for heaven's sake. The screencaps below were not ones I had planned to make. 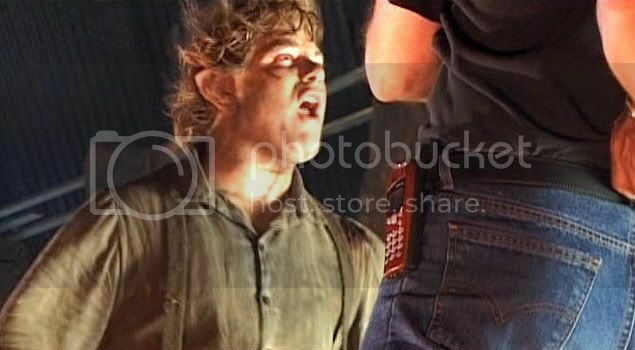 It was an interesting scene, but the focus was poor and the lighting for Frodo dim. But ms_banazira's comment in a previous entry inspired me to look at the sequence again. I decided to make the caps after all, "for the record", I guess. In this sequence, the documentary photographer is filming the shooting of Sam's coverage for the Sammath Naur scene. "Action!" a voice calls out, and Sean advances down the stone causeway that leads to the Cracks of Doom. 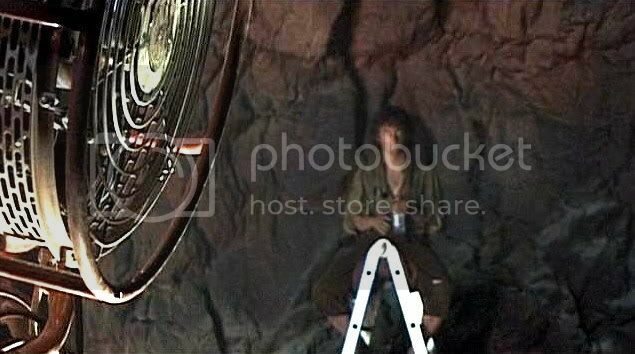 While he delivers Sam's lines, crew people angle reflectors at him and the mist-machine person shoots mist his way. Manufactured wind is blowing, lights flash on and off, simulating the flares of the fires of Mt. Doom. 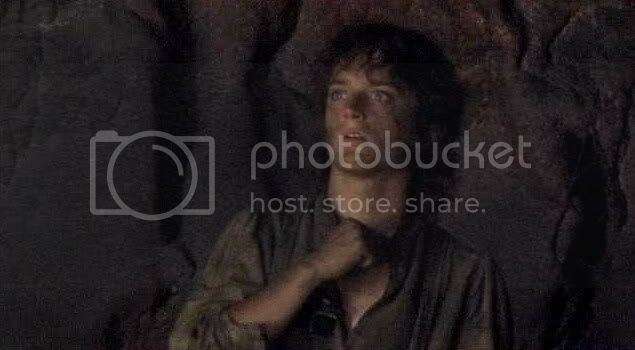 Since the camera-person is planted right where Frodo would be standing when he delivers his lines ("I'm here, Sam", and, "the Ring is mine"), Elijah is not acting the scene with Sean. Yet even as I say, "Elijah is not acting the scene with Sean," that is only technically true. As Ms_Banazira pointed out, Elijah is acting the scene, but he's acting it from a ladder off to the side, out of Sean's eye line. Blurry and ill-lit as they are, these caps demonstrate how, off-camera, Elijah was performing the scene he'd rehearsed with Sean, but in his mind. 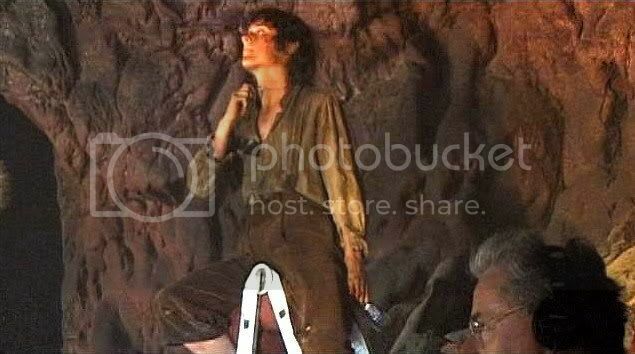 Perhaps Elijah's coverage was going to be shot next -- he's clearly in costume and make-up for the scene. It would be a form of extra rehearsal to psych himself into the scene before he had to be filmed himself. 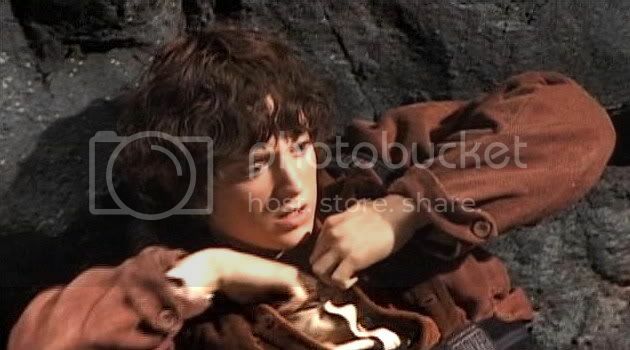 But whether he would be going on next or had already completed Frodo's coverage, it's an engaged, supportive actor who furthers the concentration and work of his fellows by investing himself wholly while they are performing -- even if he does not appear himself. 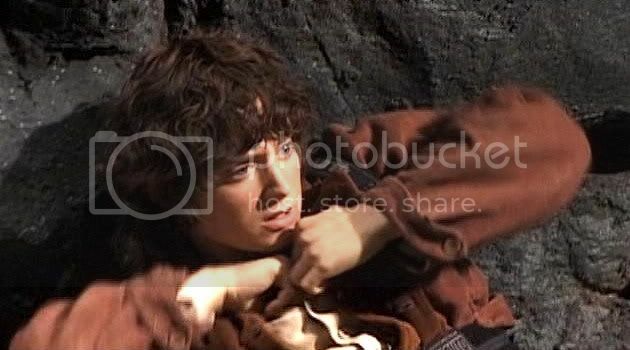 The screencaps below begin with Sam yelling, "Frodo!" 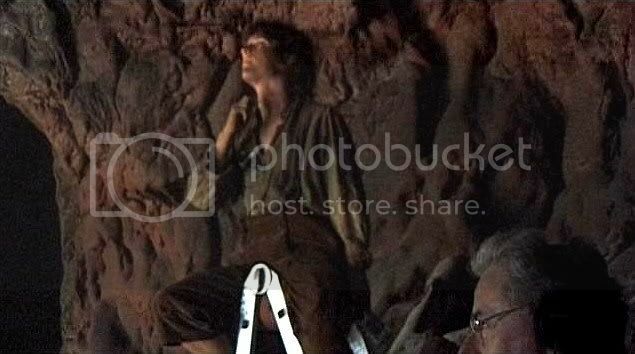 Elijah is relaxed, seated atop the ladder by the rock wall. He holds a water bottle, merely a spectator, but soon is pulled into the scene, as his expressions and body-language show. Frodo! Destroy it! Go on! Now! Throw it in the fire! Many thanks to Ms. Banazira (aka "HoneyElf") for inspiring me to go back and take a second look. Incidentally, the Extras for the Limited Edition RotK DVD are really quite good. 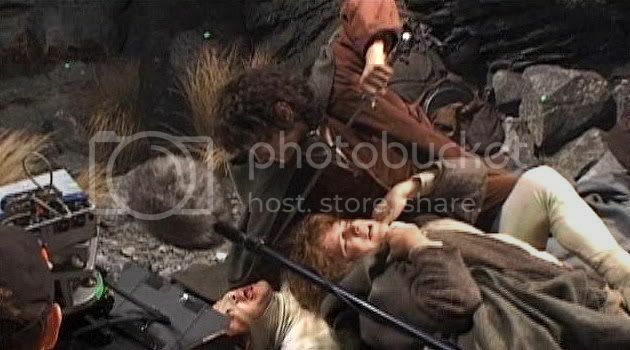 As with the Extras for TTT, while they are not chock-full of Frodo material, they are full of interesting stuff. I loved seeing how they made the rivers of lava, for instance, or how they evolved the sounds for the destruction of Barad-dûr, but things like that are not everyone's cup of tea. it's an engaged, supportive actor who furthers the concentration and work of his fellows by investing himself wholly while they are performing -- even if he does not appear himself. I love your commentary, and thank you again for sharing these wonderful screen caps with us. You are welcome, Shirebound. He certainly is an actor easy to "study". Acting while Andy wasn't there????!!!!!! They both were. Elijah and Sean ... Elijah and Andy. Wonderful commentary, Mechtild, and it's FASCINATING to see the actors doing their thing here. I'm not going to bother to check, but I think in the "thrown around" scene, Andy is there, but not near him when they are filming those close-ups. As I recall, when they talked about how they developed the way they would end up working with Andy, they did rehearsal passes for reference, then "clean" passes, in which Sam and Elijah had to mime Andy being there, trying to remember where Andy had been and doing the reactions (with help for the people who could see the Andy footage immeditately, on set). The Emyn Muil scene was the very first scene the three of them worked on together. 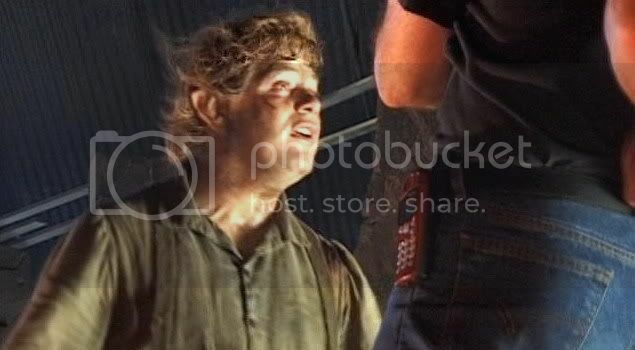 The "Go Home Sam" scene was filmed without Andy, since he hadn't been hired yet. Andy had said how odd it was to have completed a pass, with him in it, which, to him, would feel like the final take. He'd feel deflated afterwards to realise that his super-duper "final take" would not actually be the one used. But in a commentary PJ remarked that the best pass was always the one with Andy actually in it and they resorted to "painting" him out, painstaking as it was, then inserting digital Gollum. 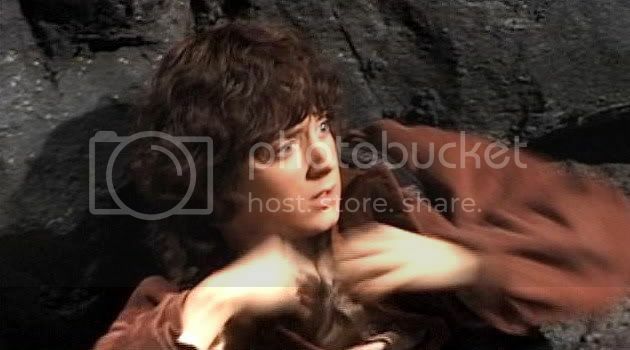 So it may be that shots like this one of Frodo against the wall being attacked was not the one used in the film, but one in which Andy actually had his hands on him, painted out in post-production -- simply because Elijah's reactions were much better when Andy really was there. Thanks for the enthusiastic response, Pearl! That is a fascinating glimpse into Elijah's acting, isn't it? I'd never have caught that but for your caps - thank you. 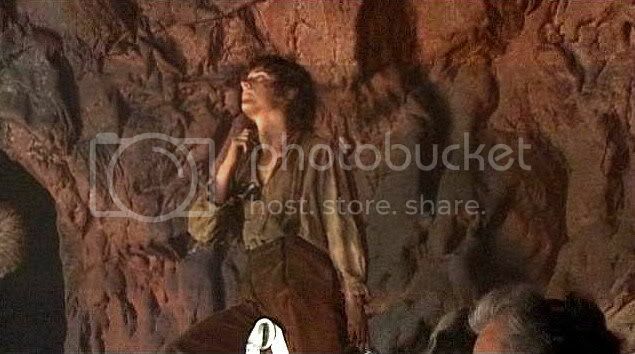 And I love seeing this other glimpse of Frodo as we see Elijah interpreting him. Oh, my! I barely caught it, too, Nota. I had mentally catalogued it as, "interested facial reaction but too blurry and little" and moved on. Only Honey's (Ms. Banazira's) comment made me go back and look again, stop-pausing through it. "Why, she's right", I said. Yes, jan-u-wine came over and took a look at these. In an email she called them, admiringly, "spooky". She remarked how, as he begins to react on the ladder shots, right hand taking the Ring, he appears to be drawn up as if pulled by invisible wires. So cool. Thanks for making these. I find this all very fascinating as well. I love how Elijah was into the scene even though he wasn't being filmed at the time. I love how Elijah was into the scene even though he wasn't being filmed at the time. Your'e welcome, Prim. I had heard that, but now I have seen it. You are welcome, Starlit! It really is a cool little sequence. Thank you, Ms. Banazira. 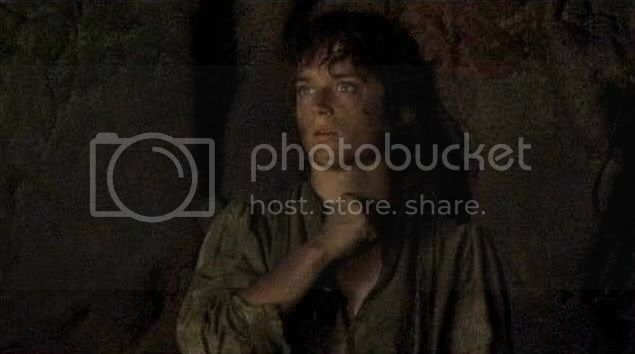 Thanks for posting all the decent images of Frodo of note. I don't want to wade through all those Extras (I'm one of the ones who doesn't like this tea.) so this is really useful for me. I showed this to Matt and he was wondering how you shut off the part of your mind that knows you are sitting on a ladder. After trying acting some years ago (and quitting because it was just too emotionally wrenching.) I told him that THAT was the easy part. The hard part is not falling off the ladder! And doing it over and over again. That is courage and toughness I do not have. Question: What did you mean by this....? "Dragged through a keyhole emotionally." Wow. And, yah, no matter what he is or isn't like in the other areas of his young life, as an actor he really does show a lot of "courage and toughness". I know I keep saying it, but I still can barely believe he did the principle photography between the ages of 18 and 20. I was such a TWIT then! Glad to have provided interest, Frodosweetstuff. He's a marvel! ((((Hugs marvel)))) I can’t believe how mature he was/is for his age. Such a professional. Many thanks Mechtild, for sharing this. "it's an engaged, supportive actor who furthers the concentration and work of his fellows by investing himself wholly while they are performing -- even if he does not appear himself. " He was absolutely great, Sean and Andy, too. I'll never get enough of the movies, of the actors and I LOVE your screencaps and comments. Again you are brightening my night Lady Moonlight! You must be up late! Don't forget to get some sleep, scnook'ums. I should go to bed? NOW! No way, tell me - how could I sleep after all this gorgeous Mr. Innocent stuff? I'm NOT a bit tired, absolutely NOT. I know it's late - it's 1 a.m. here - but it doesn't really matter. THIS doesn't really matter, LOL. I've just been going through your vast collection of beautiful screencaps from the movies and extras. These are some of the best and certainly some of the most exhaustive caps I've ever seen, and you've optimized them with such care. Thank you so much! It's such a gift to LOTR and Elijah fans to have these kinds of resources online. Why, thank you so much, Almostnever. I really loved making the caps and preparing the posts to present them. I thought they expanded my appreciation of LotR, taking me beyond the films and back into the book texts, but with new powers of visualization.